introductions by Neeli Cherkovski and David Barker. 36 pages of poems and illustrations. poem cards by both poets. 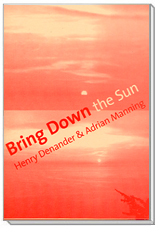 This is the first in Art Bureau's Highball Reading series; a 36 page, 11" tall and 4.25" wide poetry chapbook with poems and illustrations by Henry Denander & Adrian Manning. Cover photo by Adrian Manning.